"Our great strengths as a country have been in our openness to ideas and talent, our capacity to innovate, our excellence in higher education, a willingness to invest public resources strategically in scientific research and discovery, and the political will to confront challenges with wisdom and force." Now that it's had a bit of time to sink in, here are our thoughts on the State of the Union address made Tuesday evening. The following passages are the opinions of the authors alone and do not necessarily represent those of any affiliated organizations. Innovation is the light at the end of the tunnel for Obama. In his State of the Union speech, he spent an unprecedented amount of time discussing the role of science and research in leading the nation toward renewed prosperity. His remarks were undergirded by a fundamental belief in the societal benefits of science and pursuit of basic knowledge. Even in the face of shifting national priorities and at a time when both sides of the isle are talking about cuts, Obama has been resolute in his support of science. This is especially striking given that many of the scientific investments being made today may not bear fruit in the short term, and probably not in time for the coming Presidential election. Obama specifically mentioned the role of government support in the creation of the Internet, GPS, and computer chips. What other groundbreaking innovations should be included here? This is a tremendous opportunity for you to share how research has improved our world. By now you've read all of the promises about investing in biomedical research. Word is spreading far and wide about President Obama's call for innovation and more simply regulated salmon. Our Sputnik moment is upon us. And while others are discussing the verbage, I can't stop thinking about the construct. I have a bit of a background in speechwriting and oral communications, so much of my time watching speeches is paying attention to rhetorical devices and style. Structurally, the president started with formalities and then led his content sections with science and education. Although I believe it is a priority for him - and that should be reflected in the upcoming budget as promised - I don't think that's why he led with it. Science and education paved the way in the SOTU because they are topics everyone can get behind (as evidenced by years of public opinion data). No one wants America to be left behind. But it was more than just a warm-up; a unifying set of topics to bring on the applause. Investment in research and innovation are about to face an epic fight for funding, and by framing it his way first, the president was attempting to counter early attacks. The position in the speech is just as important as the words he used. As contradictions in the text of the speech already show, not everything mentioned on Tuesday night is going to happen. (I challenge anyone to find a SOTU where everything mentioned was actually accomplished as laid out in the speech.) However, that isn't the point of the SOTU. It's about goals, a vision, an ideal look at the future. Beyond the structure of the speech is the structural integrity of its vision. Will the president be able to make his vision reality in the face of the worst economic situation since the Great Depression and a Congress with other plans? For the sake of science, I hope so. 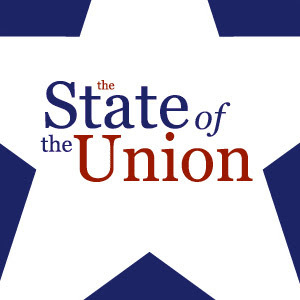 For those of you who may have missed it last night, what follows is a complete transcript of President Obama's second State of the Union address. The noted applause is that of Congress. Although we wholeheartedly applaud many of the same issues they did, New Voices will be sharing their perspectives tomorrow. Have something you want to share? Add it to the comments of email hbenson at researchamerica.org to be part of the post. What’s more, we are the first nation to be founded for the sake of an idea -– the idea that each of us deserves the chance to shape our own destiny. That’s why centuries of pioneers and immigrants have risked everything to come here. It’s why our students don’t just memorize equations, but answer questions like "What do you think of that idea? What would you change about the world? What do you want to be when you grow up?" Our schools share this responsibility. When a child walks into a classroom, it should be a place of high expectations and high performance. But too many schools don’t meet this test. That’s why instead of just pouring money into a system that’s not working, we launched a competition called Race to the Top. To all 50 states, we said, "If you show us the most innovative plans to improve teacher quality and student achievement, we’ll show you the money." You see, we know what’s possible from our children when reform isn’t just a top-down mandate, but the work of local teachers and principals, school boards and communities. Take a school like Bruce Randolph in Denver. Three years ago, it was rated one of the worst schools in Colorado -- located on turf between two rival gangs. But last May, 97 percent of the seniors received their diploma. Most will be the first in their families to go to college. And after the first year of the school’s transformation, the principal who made it possible wiped away tears when a student said, "Thank you, Ms. Waters, for showing that we are smart and we can make it." (Applause.) That’s what good schools can do, and we want good schools all across the country. Because people need to be able to train for new jobs and careers in today’s fast-changing economy, we’re also revitalizing America’s community colleges. Last month, I saw the promise of these schools at Forsyth Tech in North Carolina. Many of the students there used to work in the surrounding factories that have since left town. One mother of two, a woman named Kathy Proctor, had worked in the furniture industry since she was 18 years old. And she told me she’s earning her degree in biotechnology now, at 55 years old, not just because the furniture jobs are gone, but because she wants to inspire her children to pursue their dreams, too. As Kathy said, "I hope it tells them to never give up." Our infrastructure used to be the best, but our lead has slipped. South Korean homes now have greater Internet access than we do. Countries in Europe and Russia invest more in their roads and railways than we do. China is building faster trains and newer airports. Meanwhile, when our own engineers graded our nation’s infrastructure, they gave us a "D."
We’re a nation that says, "I might not have a lot of money, but I have this great idea for a new company." "I might not come from a family of college graduates, but I will be the first to get my degree." "I might not know those people in trouble, but I think I can help them, and I need to try." "I’m not sure how we’ll reach that better place beyond the horizon, but I know we’ll get there. I know we will." With the Super Bowl just around the corner you can bet that beer sales will get a major boost. This year, I urge you take a moment and think about where beer comes from and how it’s made. 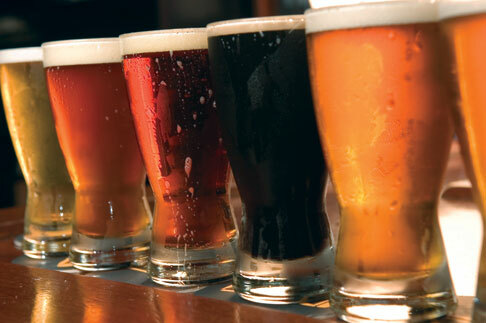 All beer includes four basic ingredients: water, malt, hops, and yeast. Beer is mostly water and for that reason, it is important to start with high quality water, but brewers have a variety of standards. Some breweries use filtered water - several Belgian microbreweries even use spring water! The Brooklyn Brewery in New York prides itself on using New York City tap water. The first step in brewing involves bringing water to a boil and combining it with malt extract, which is a monosaccharide. Malts come in dozens of varieties and can impart a diverse set of flavors from almonds, to coffee, to chocolate. Hops are also added into the wort (unfermented beer) during the boiling process. It turns out that hops are actually flowers and are in the same family as Cannabis sativa. Like malt, hops come in wide variety of flavors, but are used to add bitterness, which is measured using the alpha acid (AA) scale. Milder beers typically have an AA of 3-5% whereas stronger ales like India Pale Ale’s may use hops with AA ratings as high as 14%. Many people are surprised to learn that yeast is actually fungus and for every style of beer, there is a variety of yeast that is perfectly adapted to it. Yeast is really the workhorse of beer as it converts the malt sugars into alcohol and carbon dioxide. But the yeast can also add flavor and complexity to beer. For example, when wheat beer is fermented at lower temperatures (60 degrees F) the yeast will impart a distinct clove flavor. But raise the fermentation temperature to 70 degrees, and the yeast adds a banana overtone. So the next time you enjoy a cold one, remember all the science behind beer. Cheers! Check out these posts from the New Voices archives: Draft Beer, Not People and St. Patrick's Day Special: Beer. In the last post, I described personalized medicine (PM) and comparative effectiveness research (CER), two methods that could change medicine. A recent conference held at NIH explored the necessity of using CER and PM in concert to best treat each patient: Comparative Effectiveness and Personalized Medicine: an Essential Interface. This conference brought together many of the stakeholders in medical research to discuss the needs and implications of PM and CER. A speaker at the conference, Dr. Euan Ashley sees the future of PM as when every patient has their genetic sequence in their medical records. The genetic sequence will help with diagnosing an illness and choosing the right treatment, even choosing the right dose of that treatment. Although we aren’t there yet, in the future, everyone may get their genome sequenced--sequencing is becoming cheaper and faster, making that possible. Dr. Stephen Quake, another speaker and a researcher, has had his genome sequenced. He said that knowing you carry the sequence of DNA that predisposes you to a disease is much more effective at changing your behavior than information based on family history or environmental factors. In addition, he now knows what dose of which medication would work best for him, based on his genetic sequence. Genetics is a large part of PM. Scientists are working hard to understand the genetic changes, or mutations, that cause diseases. Also, drugs are being developed that target specific mutations, which means each patient can be prescribed a therapy that will work best for their particular disease. But, we need CER to understand the genetic information and the drugs that target those mutations. Thus, we need CER to advance PM. Come back tomorrow for the last installment in this series. It seems obvious that each person is unique, right? Then why is it that our medical system doesn’t always take that into account? Our current system for testing drugs in clinical trials requires that participants fit strict criteria to take part in the study. So, the results of the trial can only show how a therapy will work in people who fit those criteria, which most patients don’t. Personalized medicine (PM) and comparative effectiveness research (CER) are two important movements in biomedical research both working with the understanding that patients have diverse backgrounds and thus need more personalized treatment. PM takes into account a patient’s individual information, particularly their genetic makeup, when making treatment decisions. CER aims to test treatments against each other in patients with diverse backgrounds to understand which treatment is better for different subpopulations. Some people think these two concepts are in opposition because PM is concerned with individuals, while CER studies the outcome in populations. But the truth is that PM and CER work in concert to identify the right treatment for the right person at the right time. In fact, we need CER to test and advance PM so that each patient can get the most effective treatment. Tomorrow I'll describe how medicine can be advanced when PM and CER work in concert. Stay tuned. The Sundance Film Festival begins on Thursday, and so for today's Tuneage Tuesday, here are some links and trailers to films we think those of a New Voices mind might like. Which ones are you excited to see? For many of our university-affiliated readers, this is the last weekend of winter break. Hope your batteries are recharged for an exciting year ahead full of great New Voices posts! Our jobs encompass a major part of our lives. When we think about our professions, it is essential to consider how our community of professionals is perceived by others, especially policymakers. This is true for scientists. Science is vital to the well being of our nation and that is why practicing scientists and even students of science receive special treatment from the government, often in the form of grants, subsidies, or scholarships. At the end of the day, we have policymakers (often without science backgrounds) making decisions about science that could have negative impacts on research and the scientific community. The scientific community often criticizes policymakers on the grounds that they don’t really ‘get’ science, yet few scientists have any training or interest in policy or politics. However, when scientists combine their academic credentials along with a desire to change the world, the results can be dramatic. Well known examples include Albert Einstein, whose writings on the threat of nuclear proliferation informed policymakers on the specter of a nuclear armed world. James Hansen, now at Columbia University, was the first to alert members of Congress about the dangers of climate change. You may not recognize his name, but a PhD physicist and former professor, Dr. Vern Ehlers recently stepped down as the representative from Michigan’s 3rd district after a distinguished career in Congress. What these individuals all have in common is a commitment to science, but also an awareness of the role that science plays in the well being of our nation. They dedicated their intellect and zeal to ensure that science would continue to serve society, while advocating for a government that was willing to support a vibrant scientific community. Flags at half mast in front of the US Capitol. By now, I’m sure you have all read about the shooting that took place over the weekend that claimed six lives and wounded 14 people. 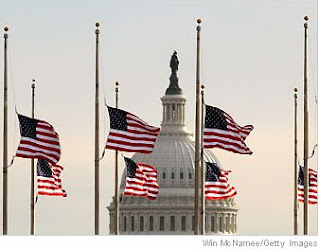 As we learn more about the victims and those affected, it is clear that they all had one thing in common – they cared deeply about our nation. These were individuals who dedicated their lives to improving the lives of Americans. I actually had the pleasure and privilege to work with Congresswoman Giffords on the House Science Committee. I remember when we met - we had great discussion about solar energy and it was not until later that I realized I had been speaking with a Congresswoman. She is without a doubt, Congress’s expert on solar power and she has always recognized that initiating new policies for solar development and deployment are good for Arizona and good for the country. I found her to be one of the most dynamic and personable representatives on the Hill. The assassination attempt represents an attack upon democracy. It was an assault upon the free society that is core to America. It raised questions of why this happened, how it happened, and what the country should learn from this great tragedy. We have already heard calls for a more civil political dialogue, one that avoids the vitriol that has colored recent campaigns and elections. This is not the first time that a concerted call for civility has been made. It wasn’t long ago that John Stewart convened the Rally to Restore Sanity on the Mall in Washington, DC. It is difficult to say just what lessons the country will take away from this event. Without a doubt, the country needs more moderated and grounded voices that can shift the discourse from one of political retribution to reasoned compromise. The U.S. is ranked 35th in math and 29th in science worldwide. We've talked about these rankings on New Voices before. You've heard them for ages. Of course everyone wants us to be number 1. But what can any one person do? What's the point? The truth is, if you're reading this post you know the statistics. You know we're dismally behind other industrialized countries where math and the sciences are concerned. You can blame it on the variance in international school systems. You can account for differences in total students being educated or percentage of education funded by the federal government. You can say that American students are just getting a more well-rounded education. Or you can stand up and say, "We're not going to take it anymore." You can pledge to get involved. To stand up for American students by personally interacting with an American student. This isn't someone else's responsibility. It is mine and yours. 1. Volunteer as a mentor or tutor. Local communities and schools have many after school and sometimes evening programs to help engage students with academic topics. Connect a mind in your community. If not you, than who? Yesterday, your new Congress was sworn into office for the 112th time in America’s history. I was lucky enough to be on the Hill for the occasion, watching the ceremonies from a closed circuit television at a reception in the Library of Congress. One of the most symbolic moments of the ceremony was when the House gavel transferred from the outgoing Speaker of the House, Nancy Pelosi, to the new speaker. As John Boehner stood by, waiting for Speaker Pelosi to conclude her remarks and hand off the gavel, he was visibly nervous, fidgeting, and seemed anxious for his turn to offer his thoughts to the chamber. Not surprisingly, he was wiping away tears before he even began to speak. Members of Congress aren’t that different from you or me. They have weaknesses, make mistakes, and often have only a surface-level understanding of the multitude of issues that cross their desk. This is why they rely heavily upon their staff, who in turn rely heavily upon experts to provide them with the best information possible. Hence, your expertise and awareness can make a difference in changing policy in the US. But in order for that to happen you must not be afraid to reach out to your representatives, tell them your story, and why they should listen. It could be the first step in improving our nation. We all know of some amazing women in science: Marie Curie, known for her work on radioactivity, Rosalind Franklin for identifying the structure of DNA, and Barbara McClintock who described gene transposition. 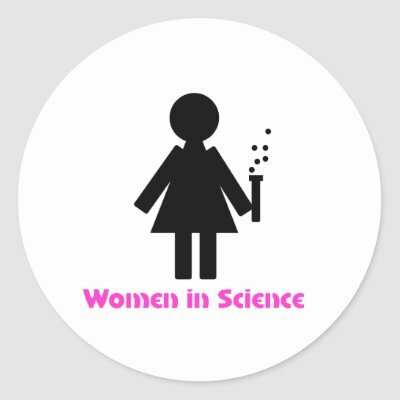 So why is there always a fuss about not enough women in science? Women have historically been underrepresented in the sciences, though there are certainly more women in science now than there have been in the past. In 1996, 35% of doctorate degrees in STEM fields went to women; in 2006, that number jumped to 46%. But the numbers are still grim in the workforce. In 2006, only 28% of tenured or tenure-track academicians were women. Of course, we can’t compare that to the number of doctoral degrees awarded to women in the same year, so I’ll walk through time. In 1988, women earned 41% of bachelor’s degrees in science and engineering. By 1990, when those students would be earning their next degree, only 34% of master’s degrees went to women. In 1996, women earned 34% of doctorate degrees, and ten years later women represent only 28% of tenured or tenure-track faculty. There is a continued decrease in the percentage of women at these milestones. Some may argue that women are “choosing” to drop out of science to have a family, but why should women have to make that choice? Surely, there are men in science who have families, and they aren’t leaving the field. There are still still factors above and beyond life choices that are making it difficult for women to attain the highest levels in science. My point is certainly not to discourage women from entering the sciences. Quite the opposite. Women are valuable employees and can bring strong and important perspectives to their jobs. A recent study showed that groups that include women are better at problem-solving, and with the renewed focus on scientific collaboration, group problem solving will be integral. Great strides have been made in diminishing the gender gap, but this issue must remain at the forefront so the gap will continue to improve. Hat tip to GrrlScientist for her post on the Axis of Awesome last spring. It’s a new year and time for a new budget! President Obama is expected to release his federal budget request for 2012 in early February. This makes for a confusing navigation of budgets, though. You see, Congress may receive the President’s request for the fiscal year (FY) 2012 budget before they have even passed the FY 2011 budget, despite the fact that FY 2011 started three months ago. And this means that most agencies are operating at FY 2010 levels. Whew! The budget process itself is dizzying. For one, what is the fiscal year? Unfortunately, the fiscal year is not concurrent with the calendar year, which just confuses everything. The fiscal year begins October 1 of the previous year and ends September 30 of the following year. So FY 2011 began October 1, 2010 and will end September 30, 2011. Ideally, the FY 2011 budget, the layout for how much money government agencies receive for that fiscal year, should have been passed by the two chambers of Congress before the fiscal year began on October 1, 2010, but that is rarely the case, especially in an election year. There is a lot for the chambers of Congress to get through and agree upon before they can pass the budget. After receiving the President’s budget request, the House and Senate Budget Committees each develop a budget resolution, which is a ceiling for how much money Congress can spend in certain categories, or “functions”. This is the allocations process. Then, each chamber debates the budget resolution. Finally, a House-Senate conference resolves the differences between the House and Senate resolutions, and the conference report must be passed by both houses. This is all supposed to be accomplished by April 15th, but rarely makes that mark. Although the budget resolution is an incredibly important step, it’s not a bill and doesn’t actually give any money to anyone, but sets the spending limit for government functions. Legislation for spending, or appropriations bills, must also be passed in the House and the Senate and the spending must fall within the allocations laid out in the budget resolution. Because the FY 2011 budget is not yet decided upon, you may have heard words thrown around like “continuing resolution,” “omnibus” and “government shutdown.” Technically, if appropriations have not been made by the beginning of a fiscal year, the government agencies should not be able to continue work and would shutdown. However, in these circumstances, Congress usually passes a continuing resolution for a set amount of time, perhaps another month, so that the government can continue operating at the previous year’s levels while Congress continues to work on an appropriations bill. For FY 2011, Congress has passed four continuing resolutions, the most recent lasting until March 4, 2011, halfway through the fiscal year! Oftentimes, when appropriations have not been made before the start of the fiscal year, the spending is combined into one large omnibus appropriations bill rather than separate bills. Congress just withdrew an omnibus bill for FY 2011 in favor of a continuing resolution in order to avoid a government shutdown. Now the incoming Congress will have to finish the FY 2011 budget and start debating the FY 2012 budget nearly simultaneously. Let’s hope this year’s budget process goes a little more smoothly than last.